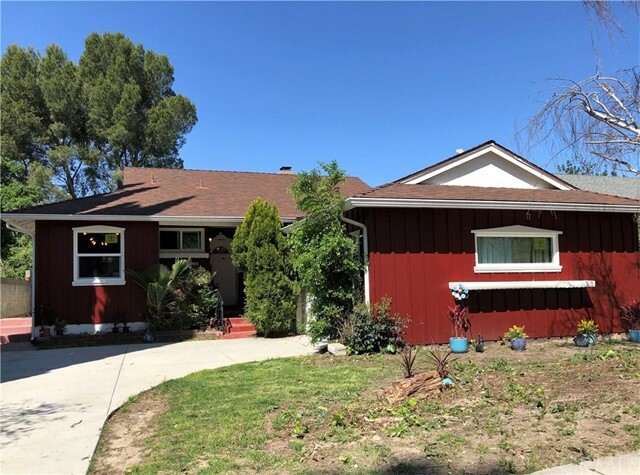 All Tujunga homes currently listed for sale in Tujunga as of 04/20/2019 are shown below. You can change the search criteria at any time by pressing the 'Change Search' button below. If you have any questions or you would like more information about any Tujunga homes for sale or other Tujunga real estate, please contact us and one of our knowledgeable Tujunga REALTORS® would be pleased to assist you. "Sited on nearly four pristine acres of Angeles National Forest hills and valleys, the award winning 'Clear Creek Residence' designed by Kiyohara Moffitt Architects in 2009 is a unique home located just 25 minutes from the Burbank studios and 40 minutes to Downtown Los Angeles. The main house, on a single level features 4 gracious bedrooms and 3 spa-like bathrooms. Vaulted ceilings in the living and dining room provide an expansive sense of space and light. The gourmet kitchen features green oasis marble countertops, custom cabinetry and a full suite of Viking appliances. Distressed hickory hardwood and slate stone flooring are found throughout. The guest house, above the 3 car garage, features a bedroom, bathroom and kitchenette. A year-round stream runs throughout the property. Permits have been secured for a barn, dressage arena, stalls and tack room. Well thought building elements include 3 HVAC units, private water well and two water tanks with capacity for 13,000 gallon water storage, 25KW generator, fire retardant materials throughout house exterior and a four inch fire hydrant on the premises. The concrete perimeter wall and buildings are structurally engineered with caissons tied to granite bedrock. APN 5869005006 is also included in sale." "Historic Retreat on over 18 Acres! Built of native stone, this beautiful cottage is set in a stand of Oak trees and possesses a feel of 'being in the mountains'. The property is only 20 miles from Downtown LA and 17 miles from the Burbank Studios.Master stone mason George Harris is credited with the construction of the home along with Bolton Hall, the main meeting place for the area in the 1920's. Though the residence is historic, it has not been registered. The home is also a legal duplex with separate entrances. A licensed arborist evaluated trees on the property and concluded an average age of 350 years with one in excess of 550 years. The grounds have been completely landscaped with native rock with 4 separate gardens with their own dedicated irrigation systems. There is a 30 foot diameter pond/waterfall with its own pump house and filtration system. Farther back with a beautiful view is a large flat plateau built for future equestrian use with water & power. There are 8 separate contiguous lots with 5 separate accesses totaling over 18 acres. There are 2 dedicated roads running through a large portion of the property.This is a truly unique property with lots of potential and becoming harder to find so close to a major city"
"Billion Dollar Views!!! Amazing custom built 2007 Home, high in the Tujunga hills. ''One Of A Kind'' Mountain top retreat. 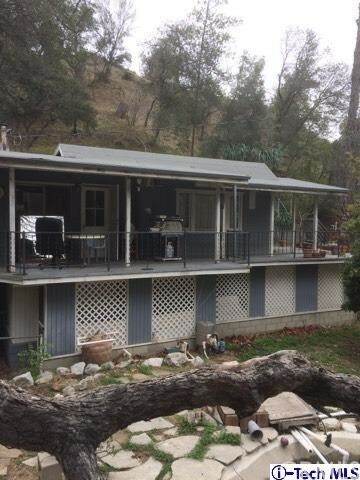 Secluded, safe in beautiful little known area of Tujunga.Huge 225 sq. ft. Loft overlooking amazing living room with fireplace and cathedral, vaulted ceilings and oversized sliding glass doors leading to a wonderful covered 260 sq. ft. view balcony with slate flooring for indoor/outdoor dining and relaxing. Loft now being used as a home theater retreat. Many skylights for lots of bright, natural light. Double car attached garage and parking spaces for 3 cars in driveway. Family room, 3 bedrooms & 3 full baths downstairs.Entry, Living room, Dining area, Kitchen & 1/4 Guest bathroom main floor.This house is special for the buyer who wants it all! WOW!!!" "This incredible Mediterranean style home with amazing view of the mountain and canyons located in a private gated community. Property features an open floor plan with higher and finishes. High vaulted ceilings, plenty of natural light, recessed lightings and a beautiful fireplace in Living room. Gorgeous gourmet kitchen has an island, granite counter tops and stainless appliances. The first floor includes the formal dining room, a full guest bathroom and an office which could be used as a 6th bedroom throughout marble floors. The luxurious master suite has a fireplace and the bathroom with dual sinks and separate shower and bathtub. The upstairs offers 5 bedrooms, 3 baths and laundry room. Well maintained backyard with a waterfall that fits in a panoramic view. Listing agent related with seller." "Fantastic opportunity for anyone looking for in Home / Work place. this property is located on Foothill Blvd. with Commercial zoning but is being occupied as a Single family residence. You can use it as Single family, Office or Both. The property has been totally remodeled in the inside with all newer windows, Lighting, Kitchen, bathrooms, Flooring and more. It offers Three bedrooms, Two Bath rooms and is over 1200 square foot. Sale includes 570 sq ft tenant occupied corner property with additional income." "Breathtaking Panoramic VIEWs of the city and mountains!! Enjoy forever panoramic view home in the most desirable and luxurious gated Renaissance Community. This beautiful two story home features 4 bedrooms and 3 bathrooms, large formal living room with formal dining area, spacious family room with fireplace and access to backyard. Gourmet kitchen opens to the family room and has a center island. The open floor plan, large windows and high ceiling fill the rooms with an abundance of natural light. The back yard is perfect from summer Bar-b-que's while you and your guest enjoy endless view. A great master suite with a walk-in closet, off master bed, his/her sinks and a jacuzzi tub with a separate shower in master bath. A large loft that is upstairs could easily converted to a 5 th bedroom or playroom, and incredible relaxing views from almost every room, makes this the ideal home for your busy family. Downstairs bedroom has bath and shower and perfect for a guest bedroom. Few minutes away from the great neighboring cities of La Crescenta and La Canada Flintridge, 25 minutes to Downtown LA. Perfect home for entertaining with a great view! Must See home!" "Welcome to this extremely Desirable Premier Padre Park neighborhood of Tujunga. This 2,482 SF home features 4 bedroom and 2 bathroom with sparkling large pool, a large living room with hardwood flooring and tiles, central A/C and heat. Two gas fireplace, with 4 skylights , remodeled gourmet kitchen with custom cabinets has built-in stainless steel appliances, Viking 6 burner cooktop and GE Monogram hood, GE Caf 27.8 CF. refrigerator, Brazilian granite countertops. There is attached 2-car garage, outside backyard provide an ideal place for your enjoyment and entertaining with large patio area, sliding glass doors with a view to the back yard. Security system with 3 outside cameras Ring video doorbell and ADT alarm system. You will find comfort and joy with the serenity offered by the surrounding mountains. This is just a Home Sweet Home." "ATTENTION DEVELOPERS/INVESTORS- HUGE LOT in process of being divided into two lots. 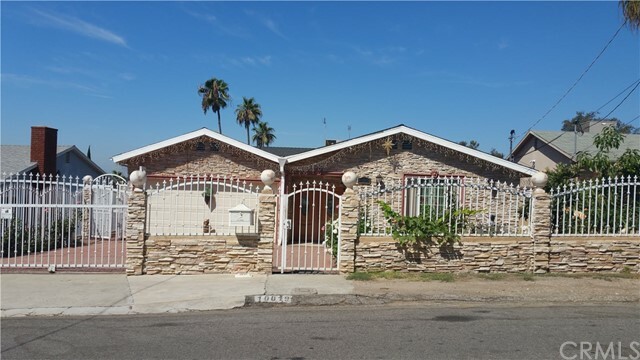 Front lot has a fabulous newly rented and rebuilt California bungalow with all new plumbing, electrics, kitchen, bathrooms and floors." "Modern Luxury meets Classic Contemporary. 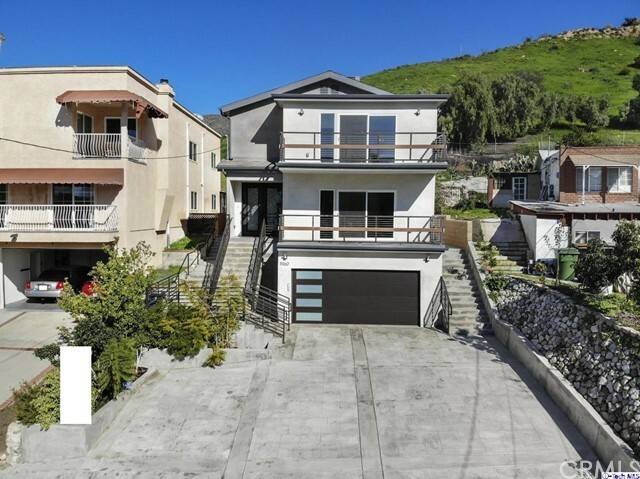 Situated on a prestigious Tujunga hilltop resides the ultimate home of 4-bedrooms(2 master en-suites), 4-bathrooms & 3,060-SqFt of impeccable living space. Perfection is in the details! Enter through an immaculate double door that paves the way into an elegant living room. Illuminated with both natural & recessed lighting the living room features a fireplace with a unique designed backdrop, as well as a balcony with lighting, a gorgeous view of the surrounding mountains & greenery. The sleek deigned kitchen comes with modern cabinets, stainless steel appliances & a center island, perfect for bar stool seating. A spacious Master bedroom that offers a private balcony, walk-in closet & a glamorous private bath with double vanities, a large walk in shower & a corner jetted tub! Other features include an eye-catching staircase with glass railing, beautifully crafted doors, unique light fixtures, recessed lighting & impressive wood/tile flooring with baseboard moldings that runs through the whole house! Hosting & entertaining will be convenient! From the open driveway (great for ample number of parking space), to the wonderfully mastered backyard with 2 spacious patios complete with lighting, stunning paving & views!" "Rare life-style offering . . . enjoy this exceptional, gated luxury home with a sophisticated, classic look and feel in a desirable neighborhood. So much to appreciate and be inspired by: High ceilings, crown moldings, tasteful marble, travertine and granite upgrades, copper plumbing, newer central A/C unit, expanded full-length balcony overlooking the beautiful, scenic back yard retreat. Impressive, private floor plan. Wide central hall leads into spacious rooms with beautiful stone flooring throughout. Remodeled kitchen features center island, granite counter-tops, attractive paneled cabinetry, and plenty of storage to provide the backdrop to gourmet cooking and hours of fun with family and friends. Back yard offers gazebo and barbecue area, fruit trees, and walkways. Extra storage under home. Perfect for entertaining for large family gatherings or simply a beautiful environment that provides for contemplation and artistic inspiration . . . An absolute must-see . . ."
"Stunning, gorgeous and with all the bells and whistles! This home is a feast for the eyes! Grand double doors take you into the foyer, with open floors plan featuring gleaming hardwood floors, spacious living room, formal dining area and gorgeous gourmet kitchen with custom cabinets, quartz counters, huge center island, stainless steel appliances, farmers sink and slider leading to the backyard. Separate step down family rooms lends so much space to be able to relax after a long day. Upstairs you will find an expansive master suite with remodeled bathroom and walk in closet, three more large bedrooms and another recently updated full bathroom. The backyard is really where it is at! With over 18,000 sq. ft. lot, gleaming pool, spa, outdoor kitchen with built in BBQ, seating areas and a lower level with sports court and trampoline.The most exquisite panoramic mountain views that are just breathtaking! Imagine watching the sunset from your own private paradise! Home also include two car attached garage, central A/C and heat, copper plumbing, dual paned windows and sliders, recessed lighting and solar panels. Located in the exclusive Alpine Village area makes the location extremely desirable! This is truly the dream home you have been waiting for!" "Artistic hideaway nestled in the Verdugo Hills with three structures on little more than 1/4 acre is for sale. Mountain living within 30 minutes of downtown Los Angeles; 20 Minutes of Burbank or Pasadena. Main house; (1100 SF) first built in late 1920s with a cistern and chalked full of charm, a perfect writers retreat! Walls of glass give way to lush privacy in a perfectly tranquil setting, hence the street name! 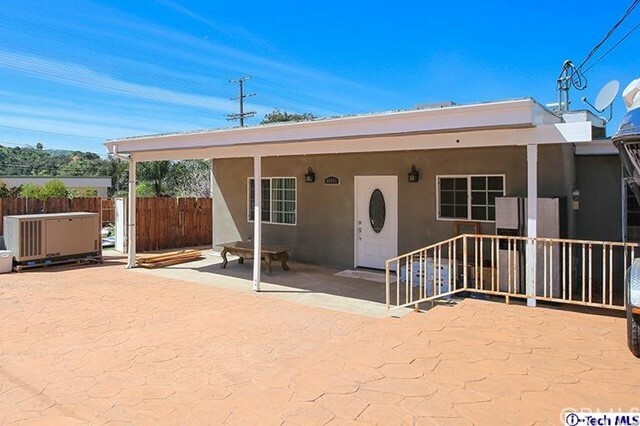 This inspirational jewel has been recently, lovingly remodeled inside/out with new windows and doors, new kitchen & bathroom, new central heat/air. If you are conservationist, you'll love having a cistern, it's used to water the grounds which includes fruit trees, saving you hundreds of dollars, and it runs year around. The Artist studio (599 SF) was built in the late 1990s complete with full bath. Great for any artist with its natural light and beautiful views of the rolling hills and sunsets. The studio has served as a rental for musicians and writers for the past 20 years. The third building (288 SF) certified for occupancy in 2000, has served multiple purposes: Office, recording studio, guest bedroom, storage, etc. Property is ideal for any artist who needs privacy, space or anyone who work from the home. This is truly a unique one of a kind property that turn key condition and ready for its new owners. Buyers to do their own independent investigation reg. sqft prior to writing their offer. Property sold AS IS." 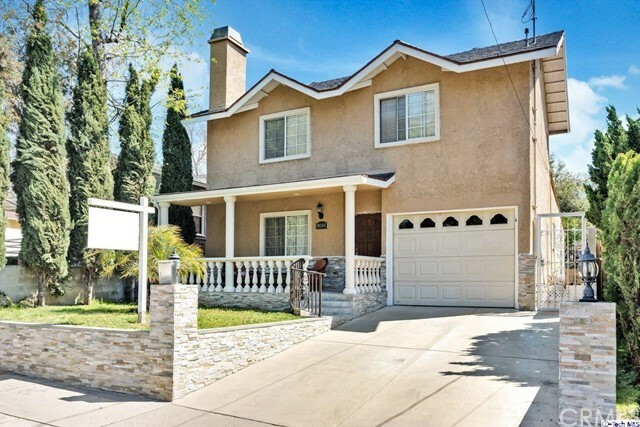 "Featuring 3-BD 3-BA + dedicated office, this 2,249 SF home is the located on a 5,790 SF lot in the heart of Tujunga. This 2-story home comprises of 2-car garage with internal access, opening into a spacious living room & dining room. The kitchen features granite counters, stainless-steel appliances, including a 5-burner gas stove and oven, French door refrigerator with ice-maker, and built-in wine cooler. The backyard features park-like grounds including water feature, decked & paved patios and a large pergola surrounded by mature succulents and hedges. The 1st floor also features full BA, laundry & office/den (that can be used as a fourth bedroom), with sliding doors to access to the back yard.The second-floor features 3-BDs and 2-BAs. The master BD features dual his & hers closets, mountain views from the windows and a large ensuite bath, and a spa tub + shower. The second bedroom opens to a patio with beautiful mountain views. A third bedroom and bathroom complete the third floor." 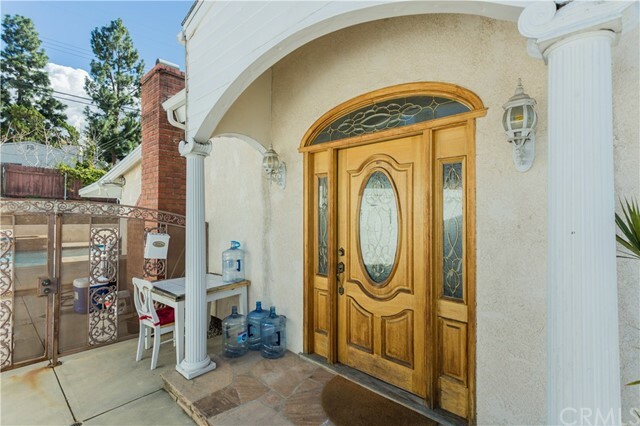 "Welcome to 10366 Pinyon Avenue in Tujunga! This Recently remodeled 2-story home features a charming exterior with nicely manicured front lawn and a darling front porch with columns posts, perfect for relaxing on after a long day. Inside boasts a fabulous floor-plan with 3 bedrooms, 2 bathrooms and 1,986-SQFT of living space. Sleek wood flooring in the main areas of the home with tile flooring in the dining, kitchen and bathrooms. This home also presents baseboard and crown moldings with vaulted ceilings, recessed lighting, new pipes, new electric, AC and heating. Take pleasure cooking in the kitchen where you have granite counter-tops, stainless steel appliances and easy patio access through the lovely French sliding door. Bedrooms are well-illuminated and offer ample closet space. The Master en-suite has a private bath, plus a large closet and recessed lighting. The back-yard features not 1 but 2 covered patios, as well as a larger open patio space surrounded by greenery and a lemon tree. Whether its hosting gatherings or unwinding with family, this home has it all!" 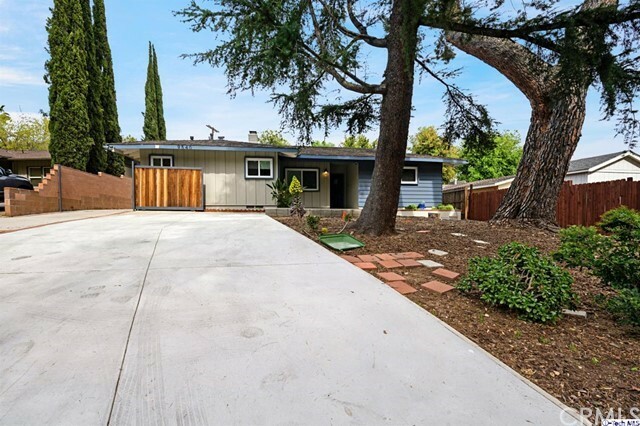 "Tastefully remodeled in 2016, this beautiful three bedroom, three bath home a modern open floor plan with wood-look laminate flooring,recessed lighting, updated plumbing and electrical with 200 amp panel.A stacked stone fire place warms the living and dining area. Gourmet kitchen with stainless steel appliances, subway tile backlash and abundant cabinetry.Relax in spacious bedrooms and master suite with a stunning glass shower. Entertain on a wide covered patio in the lush yard with mature trees and greenery. Find ample of parking with a driveway and detached two-car garage or enjoy bustling Foothill Boulevard amenities and a nearby park." "Turn-Key. 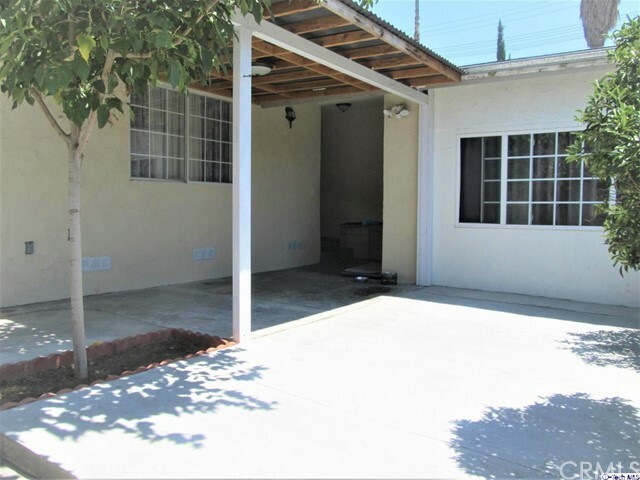 Gorgeous 3-Bedroom, 2 Bath In Tujunga. Located in a well-established neighborhood with friendly neighbors This property features hardwood floors throughout the house, makes for easy living . The open living/dining/kitchen with breakfast bar are ideal for entertaining and everyday living. French doors lead from Living/Rm to a spacious private backyard with a pool, great for BBQ's, morning coffee or a quiet evening drink. Attached Garage makes it easy to come home and relax. Minutes from the city." 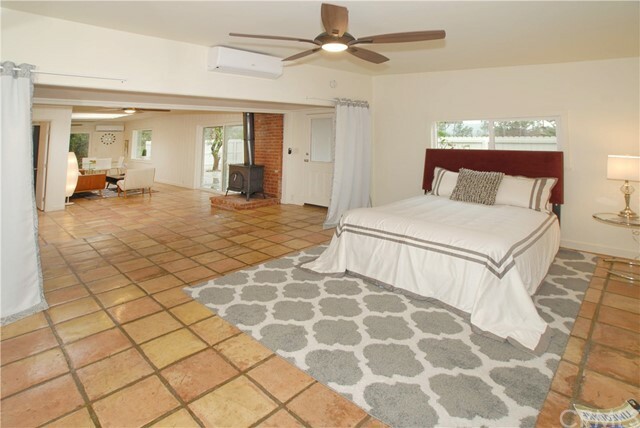 "Comfort and ease abound in this one owner mid-century ranch pool home. Imagine sharing breakfast in your country kitchen and formally entertain in your dining area off the living room which has a brick fireplace. They both overlook the large covered patio and pool, gas fire pit and built in seating. 3 generous bedrooms, 1 3/4 bahts, double car garage with workbench & upper stoage. Also has central air conditioning & heat & laundry room with pantry. Bring this home back to its original glory and beauty." "If you are looking for a home with a POOL stop now: In 2017 this large pool was completely renovated in 2017 starting from replacing the plumbing, plaster, tile, to a new pump and variable heater. 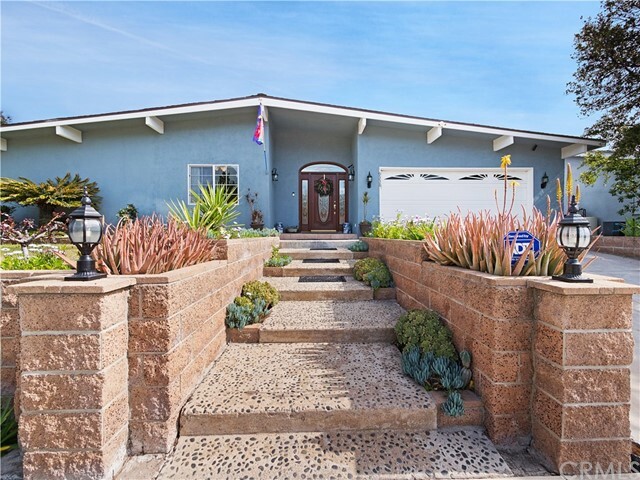 First time on the market since 1968, this 1,280 sq.ft, 3 br/2 ba home is situated on a 6,896 sq.ft. lot in a prime location of Highland Square. There have been some recent improvements and still needs so6me TLC. This home is ready to make your own. In addition to the pool, the home has a fireplace in the living room, recently installed: weather-proof windows; new pedestal sinks, toilets and mirrors in both bathrooms; installed chandelier lights in all rooms. Purchased and ready for your renovation are: a new bathtub and fixtures, a kitchen sink and fixtures, replacement doors and door knobs." "Nestled in Tujunga's desirable Seven Hills neighborhood and surrounded by mountain views, this midcentury ranch home has everything you've been searching for: location, spacious rooms, two remodeled baths, and a yard made for entertaining. The large living room features a decorative fireplace and sliding doors out to the back yard. The kitchen is open to the dining area, creating a perfect space to make dinner while the kids do their homework at the dining table. On the other side of the home are the three comfortable bedrooms. Other features include fresh interior paint, central air and heat, recessed lighting and laminate wood flooring throughout. Outside is a large covered patio, verdant trees, and plenty of space to host your summer barbecues. With its lovely location, lot size, great floor plan, and price point, this property offers rare potential and an ideal lifestyle in the foothills." "This is an investor's dream come true!!! With an RD3 zoning and a 9400sqft lot this is an ideal investment opportunity for any builders, developers or any homebuyers looking to expand!!! The existing 1700 sqft house was rebuilt in 2011. All new from the foundation to the roof!!! The house features 3 bedrooms with 2.5 baths plus a large laundry room that can be used as an office. New flooring, New kitchen with Thermador appliances, new fixtures, granite counter-tops, recess lighting throughout the house. Live in the big house and turn the vacant land into an income producing investment. This house seats on two parcels. Lots of vacant flat land for new owner to build new structures, big enough to fit 2 additional houses. Some of the additional square footage may not be permitted. Garage converted to 3rd bedroom. This is a MUST see!" 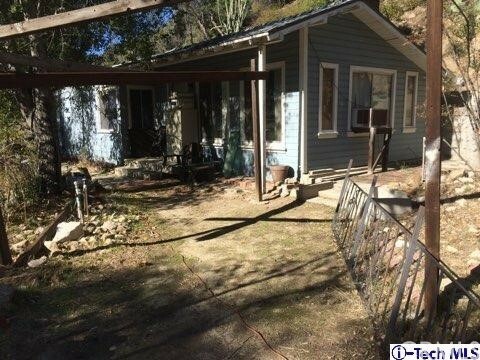 "This property is a gem nestled in the Foothills area, very quiet, close to Mountain View Elementary Magnet School. You will find this newly remodeled 4 Bedroom home with all the amenities and recent upgrade/improvement just waiting for your Buyers to move-in. This home has a remarkable combination of modern and traditional living. From the stack stone fireplace to the Italian influenced Calacatta accents throughout the kitcken, laminated floors, New Cool Roof 50 years Transferable Warranty, New GoodMan 3.5Ton HVAC, New R38 attic insulation, New air/heating duct & louvers, Costing $38.080.00 with Permit, New 200 Amp.Main Electrical panel with Permit, Tankless water heater, remodelled bathrooms, and a covered carport. Located above Foothill Blvd. 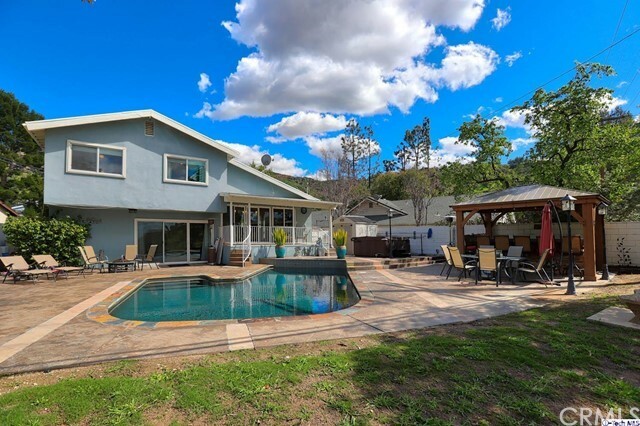 one lucky Buyer will love and appreciate a private living while being a short drive from La Crescenta, La Canada-Flintridge, Glendale and Burbank and all that the Valley areas has to offer. No repairs, SOLD AS IS and AS DISCLOSED." "Welcome home to 10418 Helendale Avenue. A single family home plus an apartment over the garage! Originally built in 1915, this Spanish style home greets you with a charming covered porch and a backdrop of the San Gabriel Mountains. Once inside, you are greeted with arched doorways and a light filled oversized living room with wood burning fireplace. The dining room has a French door that opens to a side patio and garden area. The kitchen has been recently updated with today's amenities with all stainless-steel appliances, sleek granite counter tops, designer tile backsplash and tile flooring. Double French doors lead to the rear yard and patio. This 3 bedroom 1 bath home features original wood floors and 1915 details throughout. The long driveway allows for ample off-street parking, plus a 2-car garage. Over the garage is a studio apartment with a separate entrance which is complete with a full kitchen and bath. Enjoy the sunset views from the front porch of the front house or from the deck off of the apartment."